[128 Pages Report] The license management market was valued at USD 577.5 Million in 2016 and is projected to reach USD 1,141.9 Million by 2022. The global market is expected grow at a Compound Annual Growth Rate (CAGR) of 12.6% during the forecast period. The forecast period has been considered from 2017 to 2022, whereas 2016 is considered as the base year for estimating the market study. The main objective of this report is to define, describe, and forecast the license management market on the basis of components (software and services), application areas, deployment types, organization size, industry verticals, and regions. The report provides detailed information about the major factors (drivers, restraints, opportunities, and industry-specific challenges) influencing the growth of the market. The report forecasts the market size with respect to the 5 main regions, namely, North America, Europe, Asia Pacific (APAC), Middle East and Africa (MEA), and Latin America. The report profiles the key market players and comprehensively analyzes their core competencies. This report also tracks and analyzes the competitive developments, such as mergers and acquisitions, new product developments, and Research and Development (R&D) activities, in the global market. The research methodology used to estimate and forecast the license management market began with the collection and analysis of data on the key vendor product offerings and business strategies from secondary sources, such as OneSource Business Browser, D&B Hoovers, 10K Wizard, Bloomberg, Thomson StreetEvents, Factiva, IT service providers, technology providers, press releases, and investor presentations of companies, white papers, technology journals, certified publications, articles by recognized authors, directories, and databases. Vendor offerings were also taken into consideration to determine the market segmentation. The bottom-up procedure was employed to arrive at the total market size of the market from the revenues of the key market software tool and service providers. After arriving at the overall market size, the total market was split into several segments and subsegments, which were then verified through primary research by conducting extensive interviews with key people, such as Chief Executive Officers (CEOs), Vice Presidents (VPs), directors, and executives. The license management ecosystem comprises several vendors, including Aspera Technologies (US), Cherwell Software (US), DXC Technology (US), Flexera Software (US), Gemalto (Netherlands), IBM (US), Oracle (US), Quest Software (US), ServiceNow (US), Snow Software (Sweden), Labs64 NetLicensing (Germany), Reprise Software (US), and TeamEDA (US). 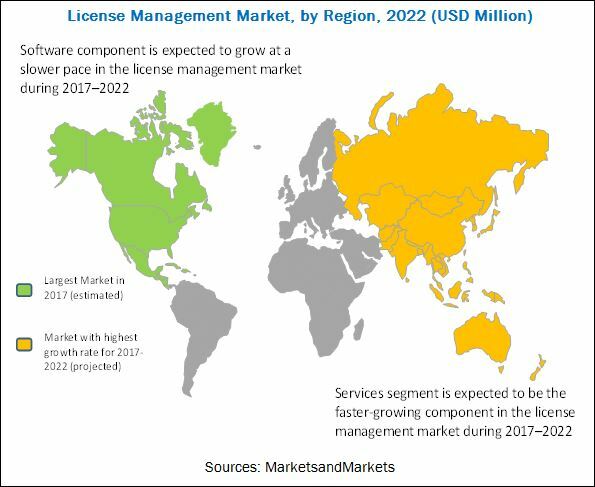 The license management market is expected to grow from USD 629.6 Million in 2017 to USD 1,141.9 Million by 2022, at a Compound Annual Growth Rate (CAGR) of 12.6% during the forecast period. Several factors, such as the growing demand to optimize software investments and increasing need for audit-readiness among enterprises, are driving the license management market growth. The increased adoption of license management software and services across various industry verticals, such as Information Technology (IT); Banking, Financial Services, and Insurance (BFSI); telecom; manufacturing; healthcare; media and entertainment; and retail and consumer goods; have boosted the growth of the market. The license management market is segmented by component (software and services), application area (audit services, advisory services, compliance management, license entitlement and optimization, operations and analytics, software inventory management, usage monitoring, and others), deployment type, organization size, industry vertical, and region. The software component is estimated to dominate the market in 2017, whereas the services component is expected to witness the faster growth during the forecast period, due to the new features offered by deployment and integration, and support and maintenance services. The professional services segment is expected to hold the larger market size, whereas the managed services segment is expected to grow at a higher CAGR during the forecast period. The professional services help enterprises in creating a highly available, secure, and superior network environment that supports the enterprise growth while accommodating the convergence of voice and data systems and traffic. Moreover, these services also help enterprises easily meet their revenue targets by limiting unauthorized and inadvertent over-deployment. The professional services segment includes deployment and integration, consulting, and support and maintenance. The cloud deployment type is expected to gain more traction and grow at a higher CAGR during the forecast period. Cloud solutions are playing a significant role in increasing the opportunities for vendors in the global license management market, as they offer organizations various advantages, such as cost-effectiveness, minimum IT investments, automatic integrations, and easy accessibility. Additionally, companies are deploying solutions in the cloud to improve their mobility and decentralize the data storage and computing. However, security continues to be a critical issue that restricts the adoption of cloud solutions. The security issue is being gradually eradicated through rigorous security tests conducted to the highest standards by third parties. 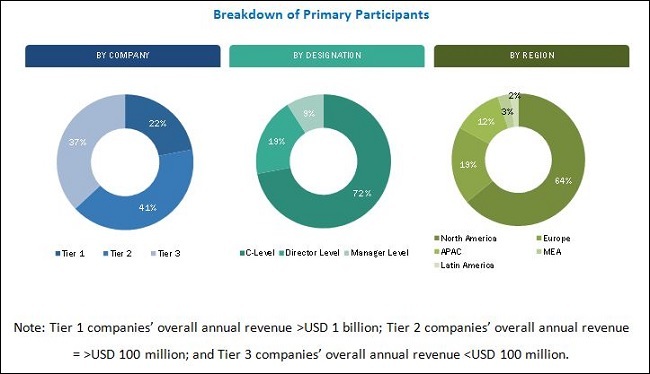 By region, the license management market has been segmented into North America, Europe, Asia Pacific (APAC), Middle East and Africa (MEA), and Latin America to provide a region-specific analysis in the report. North America is expected to dominate the global market from 2017 to 2022, considering the presence of large license management vendors in the region. The region is also considered to be one of the most advanced regions with regards to technology adoption and infrastructure. Due to this, companies are willing to invest in North America. Therefore, the competition is stiff among the major market players in this region. Stringent regulations may hinder the growth of the license management market globally. However, the recent developments, including new product launches and acquisitions, undertaken by the major market players are boosting the growth of the market. The evolving need for the virtualized environment and the rapid growth of the Internet of Things (IoT) devices are expected to provide growth opportunities to license management vendors. The major vendors offering license management software and associated services across the globe are Aspera Technologies (US), Cherwell Software (US), DXC Technology (US), Flexera Software (US), Gemalto (Netherlands), IBM (US), Oracle (US), Quest Software (US), ServiceNow (US), and Snow Software (Sweden). Some of the key innovators offering license management software and services include Labs64 NetLicensing (Germany), Reprise Software (US), and TeamEDA (US). These players have adopted various organic and inorganic strategies to achieve growth in the license management market. *Details on Business Overview, Services Offered, Recent Developments, and MnM View Might Not Be Captured in Case of Unlisted Companies.